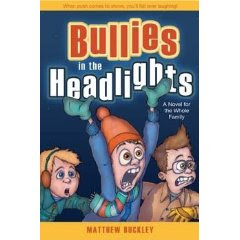 Bullies in the Headlights by Matthew Buckley is the sequel to Chicken in the Headlights. It follows the Buckley family again, this time focusing on their tough times at school. Bullies are picking on them and they must fight back. The Buckley boys enjoy getting revenge until they are forced to "pixie" their bullies' family and suddenly see them in a new light. MY REVIEW: This one was almost as funny as the first. Following this family of all boys is just plain funny. It does have a little more meaning and morals in it than the first. A cute and touching book. I recommend the audio version myself. I really enjoyed this book. It was so entertaining especially when I could look back on my childhood with all my brothers and the stuff we did. It was a good story and I was able to come away with some things to think about.